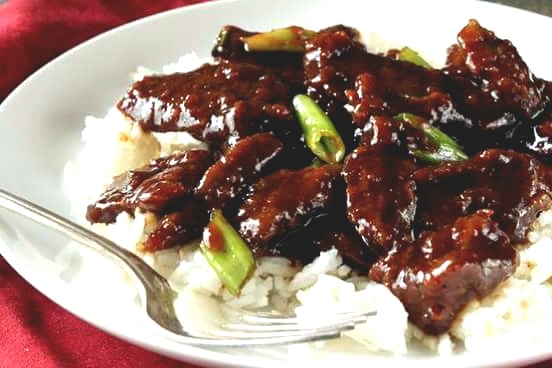 Quick and simple beef recipe. Wow so good!!! I followed the recipe and it was so delicious. I added a little more ginger, garlic and a lot more green onions since I love them so much. • 2 large green onions, sliced on the diagonal into one-inch lengths. Make the sauce by heating 2 tsp. of vegetable oil in a medium saucepan over med/low heat. Don't get the oil too hot. Add ginger and garlic to the pan and quickly add the soy sauce and water before the garlic scorches. Dissolve the brown sugar in the sauce, then raise the heat to about medium and boil the sauce for 2-3 minutes or until the sauce thickens. Remove it from the heat. Slice the steak into thick bite-size slices. Dip the steak pieces into the cornstarch to apply a very thin dusting to both sides of each piece of beef. Let the beef sit for about 10 minutes so that the cornstarch sticks. As the beef sits, heat up one cup of oil in a pan (you may also use a skillet for this step as long as the beef will be mostly covered with oil). Heat the oil over medium heat until it's nice and hot, but not smoking. Add the beef to the oil and sauté for just two minutes, or until the beef just begins to darken on the edges. You don't need a thorough cooking here since the beef is going to go back on the heat later. Stir the meat around a little so that it cooks evenly. After a couple minutes, use a large slotted spoon to take the meat out and onto paper towels, then pour the oil out of the saucepan or skillet. Put the pan back over the heat, dump the meat back into it and simmer for one minute. Add the sauce, cook for one minute while stirring, then add all the green onions. Cook for one more minute, then remove the beef and onions with tongs or a slotted spoon to a serving plate. Leave the excess sauce behind in the pan.